As much as this topic comes up, I'm sure this guide will prove itself useful. Enjoy! 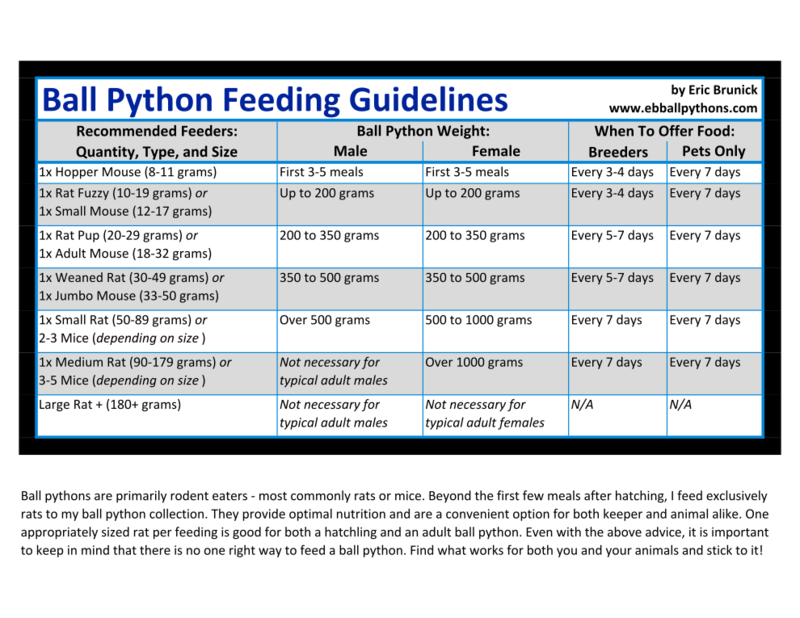 I like that is has a different feeding schedule for if you're raising your snake as a breeder or a pet. Very useful! My logic is to take advantage of a little one's increased metabolism while they are young and tend to be bottomless pits and then back off as they reach maturity in tune with their natural tendency to do so themselves. Generally speaking, though, ball pythons will do well on a once/week schedule throughout their lifetime (that is also easy for a keeper to remember what day feeding day is), which is why I kept that part in there. Last edited by Eric Alan; 12-30-2016 at 05:40 PM. I would totally print (and possibly pastlify) that and send it with any snake I'd sell. Good info Eric. Thanks for posting! I like how simple you've made it. That being said, I'm sure everyone has an opinion but this seems to be a simple comprehensive approach to feeding mice or rats to our beloved balls. Most importantly is the title you've given the chart "Feeding Guideline" to hopefully avoid conflicts. This is by far great and valuable information and I totally agree that it should be sticky worthy. Thank you for the information kind Sir!